Anything you can cook indoors, you can cook outdoors. 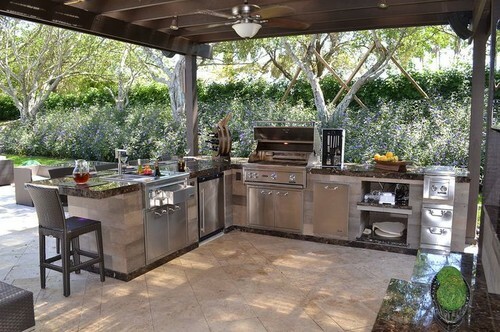 And some styles of cooking are best suited for the outdoors. If you live in a mild climate, you might do more outdoor cooking than indoors, so plan accordingly. 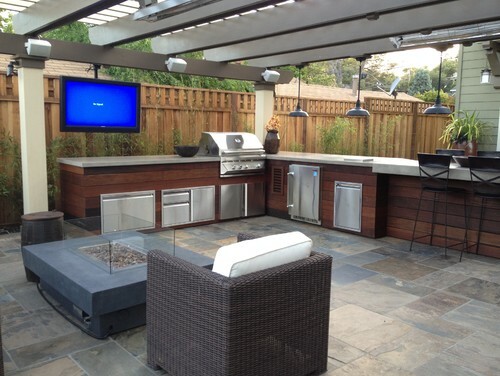 Think carefully about what types of food you plan to cook in your outdoor kitchen. Aside from a gas or charcoal grill, you might want to consider cooking appliances such as an outdoor oven (wood burning or electric), smoker, fish fryer, a tandoor (a clay oven in which a fire is built), and warming drawers. Where would you like to prep? Some cooks are content to prepare the food indoors and schlep it all outside to cook. 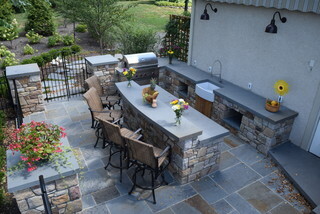 But if you prefer to do your food prep in your outdoor kitchen, plan for plenty of work surface (aka countertops!). For outdoor food prep, you'll probably want a sink as well. And for total outdoor cooking convenience, be sure to include a refrigerator, too. What size kitchen do you need? 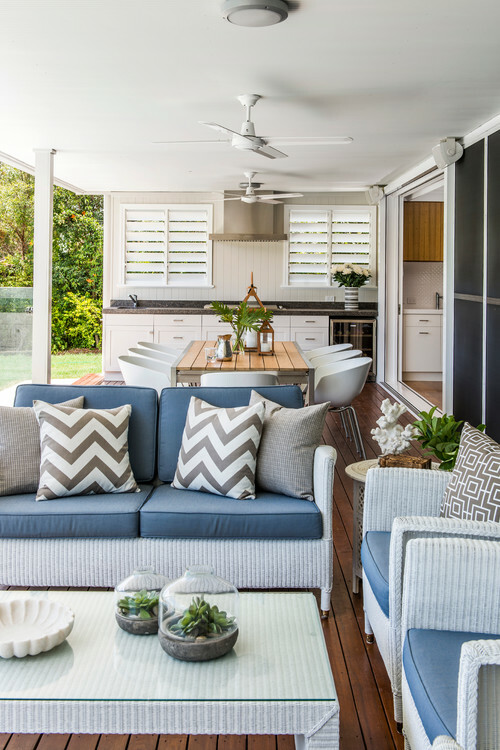 The number of appliances and the amount of prep you want to do outdoors will determine the amount of space you need for your outdoor kitchen. Consider how all of these appliances will fit within your plan, how much room to allow for them, and how to arrange them so that you are not taking a lot of unnecessary steps (think cooking triangle!). The old saying "buy once, cry once," is applicable here. 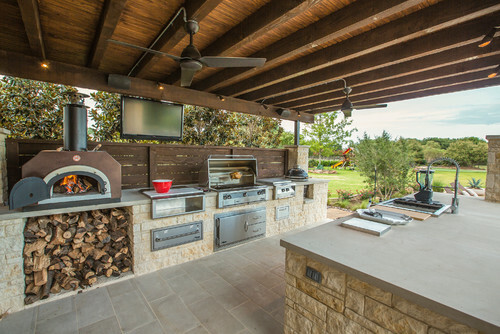 Outdoor kitchen appliances and materials receive a lot more abuse than their indoor counterparts because they are exposed to the elements, so keep this in mind when shopping. 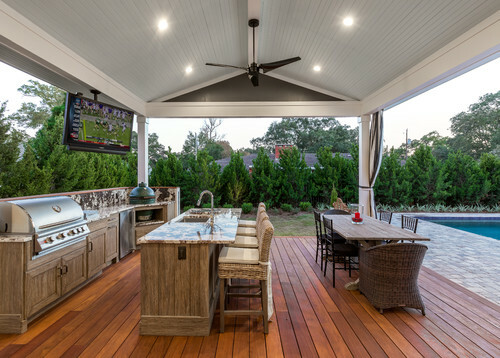 And don't forget that appliances and surfaces will need to be covered when not in use, so think about the time and effort involved in outdoor kitchen maintenance. Sometimes simpler is better. Ready for the fun part? 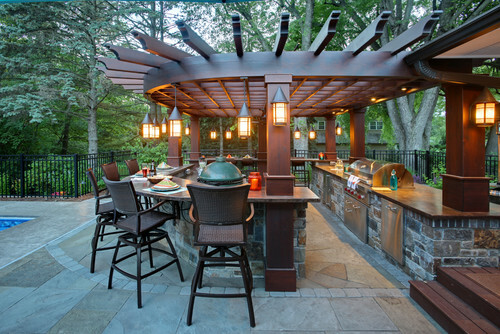 Here's a look at some amazing outdoor kitchens to get you started on your outdoor kitchen design dreams! Our premium American steel brackets are durable enough to withstand the elements. 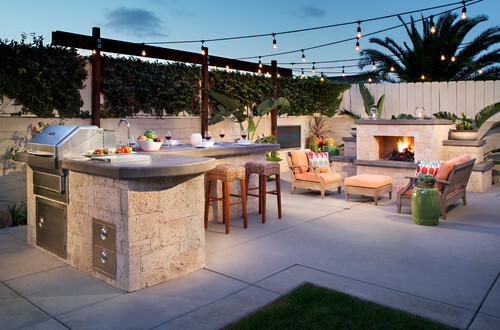 From outdoor countertops, bar tops, and kitchen islands to floating garden benches and hearths, you can depend on The Original Granite Bracket®. Connect with us any time – we're here to help! Photo by Ettore Masonry Inc.